When you want something a little different to satisfy your craving for a sweet treat, Australian candy may be just what you’re looking for. Australian candy, such as Australian red and black licorice is appreciated for the rich, full, intense flavor it has. The flavor of Australian black licorice is achieved by the use of licorice extract and a uniquely flavored oil derived from the anise plant. Australian candy can take your snack time to a more flavorful level. In addition to the flavor, the texture of Australian licorice makes it more impressively palatable and a more satisfying, long-lasting snack. You can diversify your candy options and treat your taste buds to new experiences by exploring various types of Australian candy. Australian liquorice is a good example of a candy that differs slightly from the licorice made in the United States. Australian liquorice differs in appearance, texture and flavor. Rather than being long and slender like licorice strings, Australian licorice comes in solid pieces. Some people would say the pieces are bite-size while others find the candy easier to eat when the pieces are cut in half. The pieces have distinctive ridges and there’s just a slight twist to each piece. Instead of having a hollow center, Australian licorice has a solid, soft, chewy center. Australian licorice has a distinctive licorice flavor derived from licorice extract and aniseed oil. The pieces also have a hint of a smoky, earthy flavor that comes from the combination of wheat flour and molasses that are used to make Australian licorice. The overall flavor of Australian liquorice is richer than other types of licorice. Red and black licorice have a soft chewy texture. Both types of candy are cholesterol free, nearly sodium free and almost fat-free. In a serving size of 11 pieces of either the red or black licorice, there are 140 or 120 calories, respectively. There’s approximately 30g of carbohydrate in this chewy candy. There is a distinct difference between red and black licorice. Australian red licorice doesn’t taste like licorice. Instead, it has a delightful strawberry flavor. 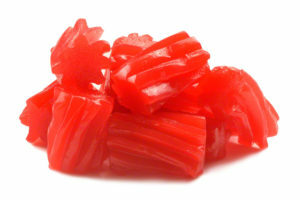 If you fall into the category of people who love chewy candy but don’t love the unique licorice flavor, red licorice would be a satisfying alternative. Both red and black licorice are excellent portable snacks. They can easily be stashed in a backpack or packed in a lunch bag. They’re a snack that kids can enjoy while doing homework or watching TV. Studies show that the act of chewing can relieve stress. Therefore, you might want to keep some licorice candy in your desk drawer at work so that you have some on hand for stressful days. Australian licorice might be a good snack to indulge in when studying for exams or when you’re feeling a little sluggish. Once you become enthralled with Australian licorice, you may want to stock up on both varieties so that you’ll always have a supply on hand. Don’t hesitate to buy Australian candy such as licorice pieces in bulk. When stored properly, it has a long shelf life.